If you're in search of a casual yet totally stylish look, team a black leather biker jacket with black wide leg pants. Both items are totally comfy and will look fabulous together. Up the cool of your outfit by completing it with black suede pumps. For a smart casual getup, marry a beige trenchcoat with Comme Des Garçons Noir Kei Ninomiya wide leg tied waist trousers — these pieces play perfectly well together. When it comes to footwear, this getup pairs really well with black suede pumps. If you're on the hunt for a casual yet absolutely chic look, marry a green-yellow blazer with Comme Des Garçons Noir Kei Ninomiya wide leg tied waist trousers. Both garments are totally comfy and will look fabulous paired together. To bring out the fun side of you, complete your ensemble with burgundy suede high top sneakers. For a knockout-meets-chic ensemble, marry a navy coat with Comme Des Garçons Noir Kei Ninomiya wide leg tied waist trousers from farfetch.com — these pieces fit well together. Grab a pair of white leather low top sneakers for a more relaxed feel. For a casual absolutely chic ensemble, try teaming a black coat with Comme Des Garçons Noir Kei Ninomiya wide leg tied waist trousers — these items play really well together. For something more on the daring side to complete this getup, grab a pair of black leather chelsea boots. 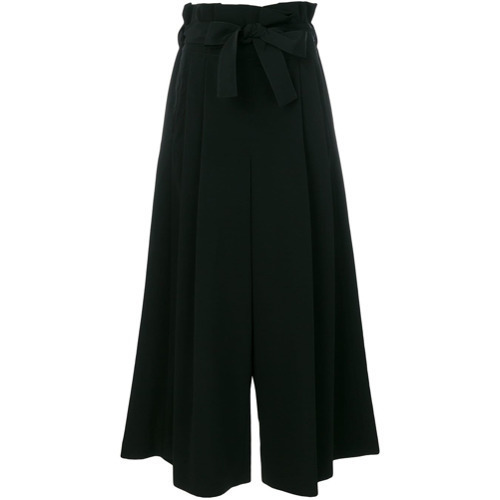 For a casual totally stylish outfit, reach for a black coat and Comme Des Garçons Noir Kei Ninomiya wide leg tied waist trousers — these items fit nicely together. 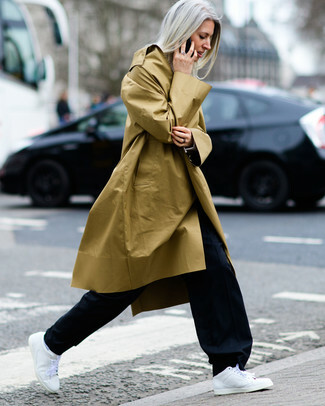 For something more on the daring side to complete this getup, make white slip-on sneakers your footwear choice. For a smart casual outfit, consider pairing a tan trenchcoat with Comme Des Garçons Noir Kei Ninomiya wide leg tied waist trousers from farfetch.com — these pieces fit really well together. Want to go easy on the shoe front? Opt for a pair of white leather low top sneakers for the day. This pairing of a blue bustier top and black wide leg pants is simple, chic and so easy to imitate! If you're on the lookout for a casual yet totally stylish look, opt for a white knit oversized sweater and black wide leg pants. Both garments are totally comfy and will look fabulous paired together. Bump up the cool of your ensemble by finishing off with beige leather pumps.